Franklin Park East Leyden H.S. "Eagles"
Franklin Park (population: 19,800) is located in western Cook County in northeastern Illinois, less than 15 miles west of downtown Chicago. The town can be reached by Mannheim Road (which is also designated as US Routes 12 & 45) along with Franklin and Belmont Avenues. Franklin Park is also bordered by Interstate 294 (aka Tri-State Tollway), and is only three miles from O'Hare International Airport. Metra also provides train service to and from Chicago. Although the area was settled as early as the 1840's, it wasn't until around 1890 that Lesser Franklin gave the community its name. His vision for the community was to intergrate residential areas with industry, and as it turned out, a number of manufacturers came to Franklin Park to set up shop. Franklin Park was incorporated in 1892, and brought a number of Slavic, Italian, and Polish immigrants to settle down and raise their families. 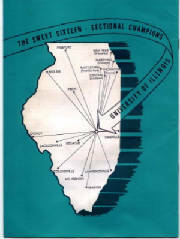 With the advent of the interstate highways during the 1950's and '60s, the village was considered an ideal location for industry and had many spur routes for railcars, which was a key ingridient to moving business along to the American public logistically, and the nearby O'Hare also took advantage of Franklin Park for its cargo terminals at the airport. East Leyden High School was formed in the fall of 1958 after there was only one school, Leyden Community High School, serving both Franklin Park, Northlake, Rosemont, and other nearby communities. The original high school opened in 1911 and expanded from a one-year to three-year curriculum within two years. A fourth year was not added until 1924 when the district was formed. The school was built in 1926-27, adding on four times before deciding to build a campus in Northlake, which was to be called West Leyden, and the remaining school would be known as East Leyden. 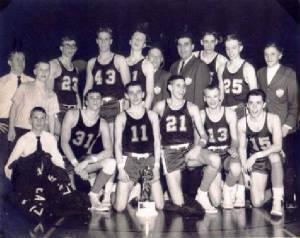 The split took place in 1958 and both schools had their own extracurricular activities. 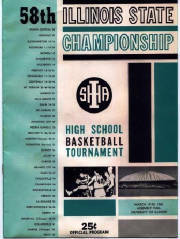 However, due to a poor ecomony and a possible downturn in students enrolled in each school, it was decided with the beginning of the 1981-82 school year that both schools would remain open, but the athletics and possibly other extra-curricular activities would be combined as one school. That arrangement still exists today as the schools compete together as Leyden High School, located in both Franklin Park & Northlake. The Eagles were competitive in wrestling, basketball, and football, in addition to track, swimming, golf, gymastics, and on the girls' side, the school won titles in girls' basketball, softball, and track. It is believed that the school could have offered other sports, but the IHSA website (www.ihsa.org) does not have a listing in baseball, volleyball, or other sports that would be offered at East Leyden. Anyone who has more details about these sports and others at the school is invited to contact us at eganann@sbcglobal.net. Sal Fuscone----STATE CHAMPION at 103 pounds!!! Dennis Owens---STATE CHAMPION at 138 pounds!!! Larry Foster----STATE CHAMPION AT 138 pounds!!! Bill Laursen---STATE CHAMPION at 145 pounds!!! Gary Drury---STATE CHAMPION at 138!!! Ken Monroe---STATE CHAMPION at 165!!! Brian Castle---STATE CHAMPION at 138!!! Bob Holland---STATE CHAMPION at 145!!! Bob Holland---STATE CHAMPION at 155!!! Ernie Krist---STATE CHAMPION at 132!!! Randy Conrad---STATE CHAMPION at 126!!! Dave Krist---STATE CHAMPION at 132!!! Jim Farina---STATE CHAMPION at 138!!! Kurt Bankson---STATE CHAMPION AT HEAVYWEIGHT!!! Jim Farina---STATE CHAMPION AT 145!!! Coach Farina went on to win a total of 644 duals, 364 of them at East Leyden (with 33 losses and four ties). His win-loss percentage was an outstanding 91.27% in the 23 years that the school had its own wrestling program!!! In addition, the 592 victories he gained at Leyden and East Leyden between 1954-90 are the most by a coach at one school in Illinois. He was inducted into the National Federation of State High School Association's Hall of Fame in 1987. OUTSTANDING JOB BY THE EAGLE TANGLERS!!!! 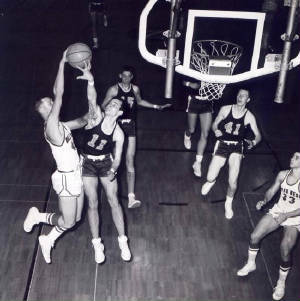 After a slow start, the Eagles took off and soared under coach Lou Granzin, then later with Norm Goodman. East Leyden won five regionals, two sectionals, and had an impressive 104-4 record in four seasons, three of them with all-stater Glen Grunwald. East Leyden won 108 regular season contests in a row at one point and 71 consecutive conference games. Harvey Thornton would place 4th in tourney. York lost in Elite 8 game. Proviso East lost in Elite 8 round. St. Joseph lost in title game of tourney. Lyons lost Sectional title game. More about Glen Grunwald: The 6-9 center was all-state all four years at ELHS (which makes him the only player to have achieved this mark), and helped him earn a scholarship to Indiana University, where he later captained the 1981 NCAA Champions to a title over North Carolina for coach Bob Knight's Hoosiers. Grunwald scored 2,355 points in his East Leyden career, and later went on to become general manager of the Toronto Raptors of the NBA, and now serves as an assistant general manager for the New York Knicks. The Eagles made a name for themselves during the 1970's by winning the state title in what was the largest IHSA football class at that time (5A) under coach Jack Leese in 1977. They also qualified for the 5A playoffs on two other occasions during the same decade. Notable alumnus: Denver Broncos head coach Mike Shanahan graduated from East Leyden HS in 1970. He was a quarterback for the Eagles during the late '60's and attended Eastern Illinois University before an injury ended his career. From there, he became an assistant coach and worked his way up to the head coaching spot with the former Los Angeles (now Oakland) Raiders before taking over at Denver and guiding them to back-to-back Super Bowl victories in 1998-99 . Starting out in the first school year when both East & West Leyden opened, the Eagles had a strong boys' gymnastics squad. ELHS went to the state finals for three consecutive years and came away with a top five finish each time, not to mention that that the school also three individuals come home with medals for taking a top-five finish in their events. The head coaches' name is unknown for these teams. In its final year of having its own softball program, East Leyden rolled to the state AA finals to give its fans a season to remember before losing in the quarterfinals under coach Pat Owen. In keeping up with Title IX reforms in Illinois high schools in the 1970's, East Leyden also offered track to its female athletes. A pair of Lady Eagle track stars came home from the state finals with medals to show their top-four or better finishes in Charleston on three occasions, as listed below. Just like the girls, the Eagles' boys' thinclad team also produced a couple of top five finishes at the state meet. More information about this program would be greatly appreciated. We do know that East Leyden's girls could also hoop it up as well as the boys' team. In the school's final year of offering athletics as ELHS, they were regional champions. We are hopeful that an alumnus may know more about this sport and can offer more information, such as win-loss records and names of head coaches. The Eagles were represented at the state meet at least once as William Elder came home with a medal for his efforts in the 200 Individual Medley event. --Jonathon Cain--keyboard player and songwriter for the rock groups The Babys and Journey. Wrote the song "Faithfully" for Journey, which became a big hit about life on the road for a rock band while touring the country. The alumni of East Leyden High School remember their sports program very well. One alumni group has its own website and its own newletter. The newsletter and website are operated by members of the class of 1965. The website can be viewed at the web address of http://www.leyden65.com/ . 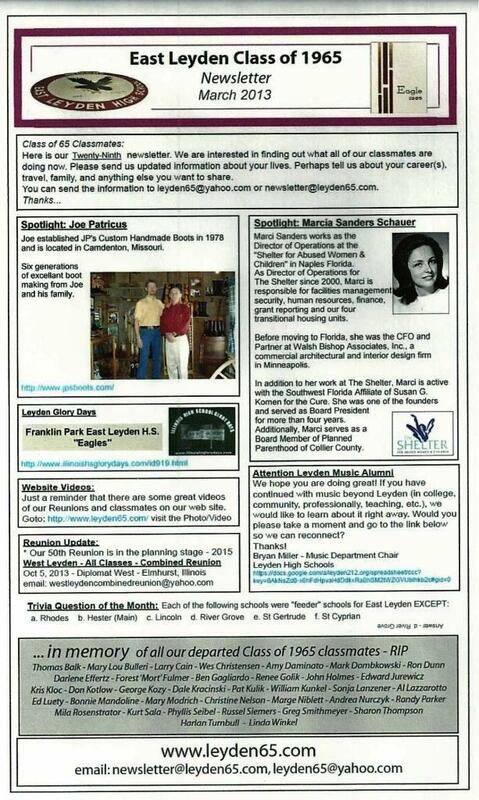 A copy of the group's March of 2013 newsletter is available below. then please let us know. As you can tell, there are plenty of gaps to fill in, and there can be more details about more than just sports at East Leyden High School, such as activities, alumni, and more. Please contact us at ihsgdwebsite@comcast.net or thru the USPS at the following address.